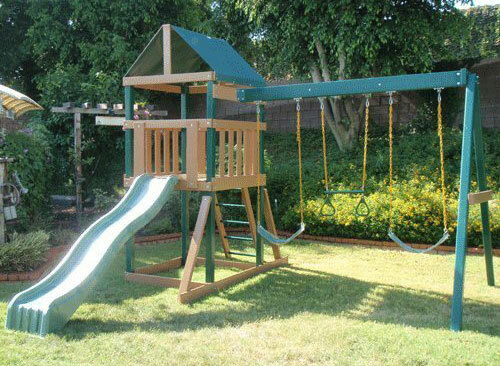 There are many types of swing sets available made from a variety of materials. A lot of swing sets are made from wood. Wood swing sets look very nice and have many benefits. Vinyl swing sets are another option. There are many advantages of vinyl swing sets compared to wood swing sets. 1 What is a vinyl swing set? 3 What Vinyl Playset Should I Buy? 4 So Should I Consider a Vinyl Swing Set? What is a vinyl swing set? A vinyl swing set is composed of lumber that has been treated with preservatives to prevent rot and decay. 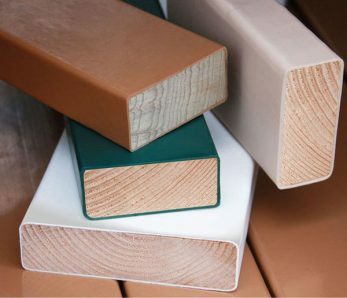 The lumber is then coated in polyvinyl chloride (PVC or vinyl) polymer. The vinyl is UV protected so it won’t fade or degrade in the sun. Often times vinyl-coated lumber is used for the structural components of the swing set including the beams and poles. Wood composite is used for the rails and deck of the swing set. In some sets the whole structure could be made of this vinyl-coated lumber. Wood composites are made from wood fiber and plastics; both the wood and the plastic are recycled materials. 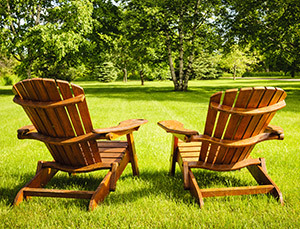 Wood and vinyl-coated wood are both great materials for swing sets. They both have advantages and disadvantages. Wooden and vinyl swing sets generally cost about the same for the same features. Vinyl is slightly less expensive because the core wood is an inexpensive wood. 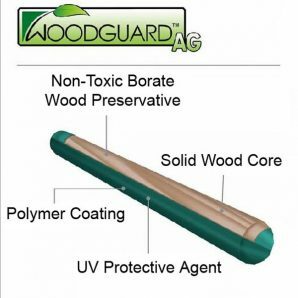 The vinyl coating protecting the core increases the life of the core wood. Wood swing sets are generally made from redwood or cedar, two types of wood that are excellent at resisting rot, decay, and insects. The interior of the vinyl swing set also contain wood, however it is a different type. The type of wood used is less resistant to rot and decay on its own. It is, however, treated with non-toxic preservatives to ensure longevity. The vinyl coating also assists in its ability to resist rot and decay. The lumber for most vinyl and wood sets come pre-cut with the holes pre-drilled. This allows the assembly of the playset to be quick and painless. The biggest advantage of the wooden swing sets is the look. Many of the wood swing sets have club houses that with, windows, shutters, and wooden roofs look like cute little houses. Vinyl-coated swing sets with wood composite can achieve the same affect. The best part of a vinyl swing set is that no maintenance is needed once the swing set is assembled. The coating and composite materials will not crack, peel, or fade. Wood swing sets need to be stained and sealed annually. Some wood sets come pre-stained and sealed, but the seal does not last forever and will need to be re-done in order to prolong the life of the swing set. Vinyl swing sets also have many safety advantages. They do not chip or crack which means no splinters. Also, because no wood is exposed, wasps and bees will not nest in them. What Vinyl Playset Should I Buy? The Congo Monkey Play System IV is a play set with a lot to do. There are two slides, a set of swings, and a trapeze bar. The most interesting part of this play set is there are three club houses. Each club house or deck has a fabric sun shade and wooden slates for the sides. A lot of imaginative play can happen in those club houses. Under the tallest club house is a picnic table and attached benches. That would be the perfect place for kids to take a break from play to have a snack. A sandbox can be set up under the middle-sized clubhouse. The smallest clubhouse is accessed by a ladder. This is perfect for smaller kids. For bigger or more adventurous kids a rock wall is attached to the middle clubhouse. A flat slide can be accessed from the middle clubhouse and a covered slide from the tallest clubhouse. This swing set is fairly large. It measure 14’ long and 24’ wide. With the recommended safety zone around the swing set an area of 30’ by 32’ would be needed. This would be excellent for a larger backyard. The playset is recommended for children ages 3 and up. The Congo Monkey Play System I would be wonderful choice for a smaller backyard. There is a raised deck that is covered by a fabric sunshade. The deck (or clubhouse) is accessed by both a rock wall and a ladder. That is great for preventing bottle-necks during busy play sessions. The slide is reached from the club house. There are two swings and a trapeze bar located next to the clubhouse. Under the deck a sand box made be installed. There is also a fireman’s pole attached to the clubhouse as another option. What fun! 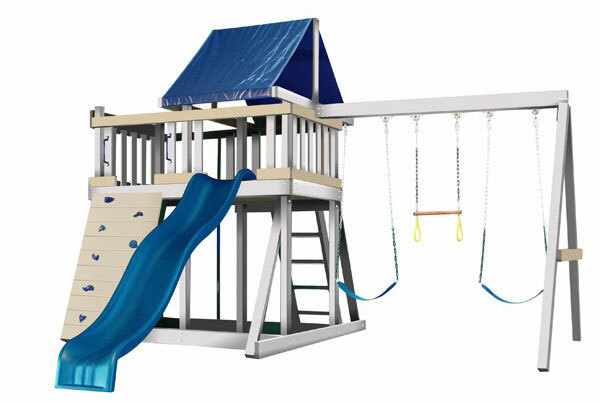 The playset measures 14’ long and 16’ wide. 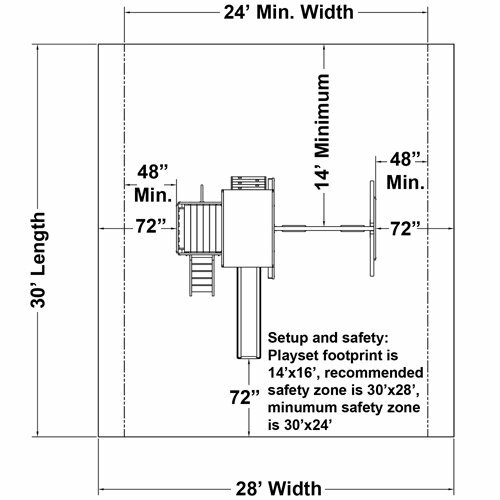 The recommended safety zone around the swing set would increase the swing set footprint to 24’ long and 30’ wide. The playset is recommended for children ages 3 and up. 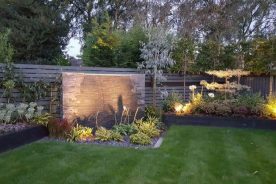 This would be perfect for a smaller backyard and still have plenty to do to keep the kids entertained for years on end. 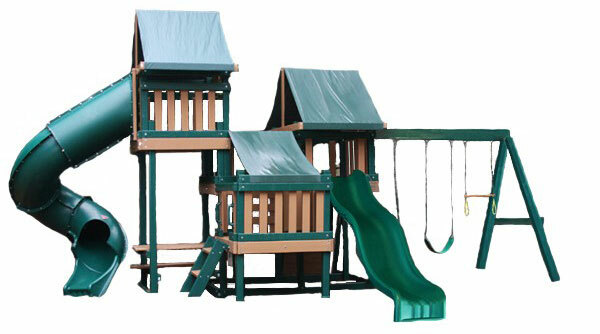 The Congo Safari Play System is another excellent option for a smaller yard. It features a fun clubhouse that will be a great place for play house, pirate ship, or even UNO. A fun slide is attached to the clubhouse. The clubhouse is covered in a fabric sun-shade. Two swings and a trapeze bar are attached to the other side of the clubhouse. The bottom part of the clubhouse may be used as a sandbox. Children and their imaginations will find endless ways to play on this set. The playset is recommended for children ages 3 and older. 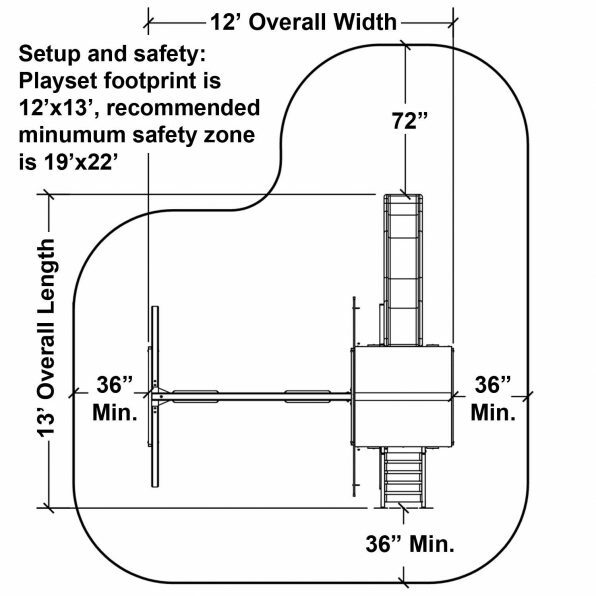 The playset measures 12’ long and 13’ wide. 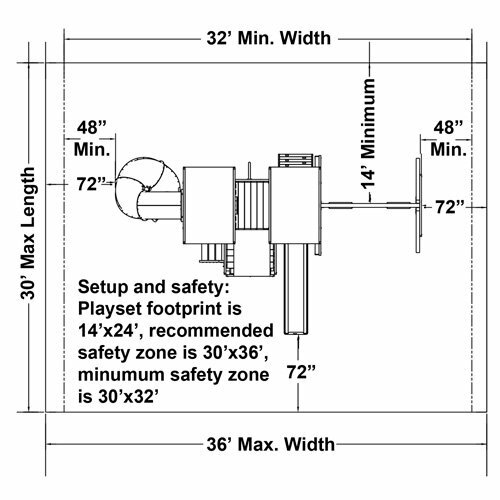 The recommended safety zone around the swing set would increase the footing to 19’x22’. So Should I Consider a Vinyl Swing Set? Vinyl swing sets have many features that are comparable to wood swing sets. They are easy to assemble (pieces come pre-cut and pre-drilled), look great, and have many of the same play features as wood sets. 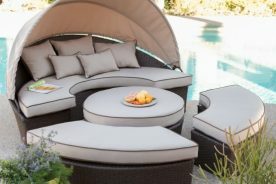 Vinyl swing sets have a great advantage over wood in that no maintenance is required after assembly. Check out our articles on metal swing sets and wooden swing sets for more information. 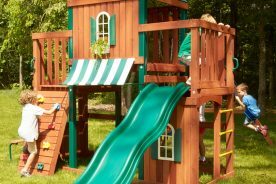 Be sure to read this Backyard Swings and Playsets guide over at ConsumerAffairs if you are in the market for more brands.